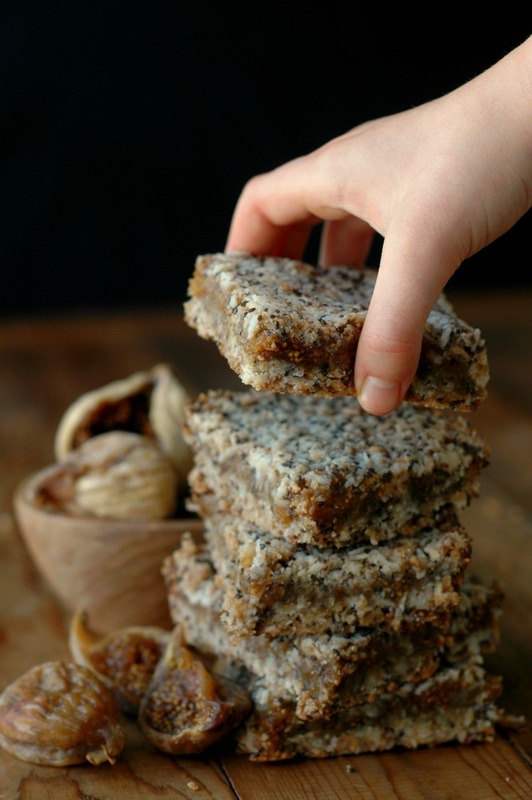 Make breakfast or snack time count with quick prep, freezer friendly, and power packed gluten free fig breakfast bars! The great winter produce dilemma! Well in the north it’s a dilemma at least – especially if you don’t want to pay an arm and a leg for out of season fruit and veggies. 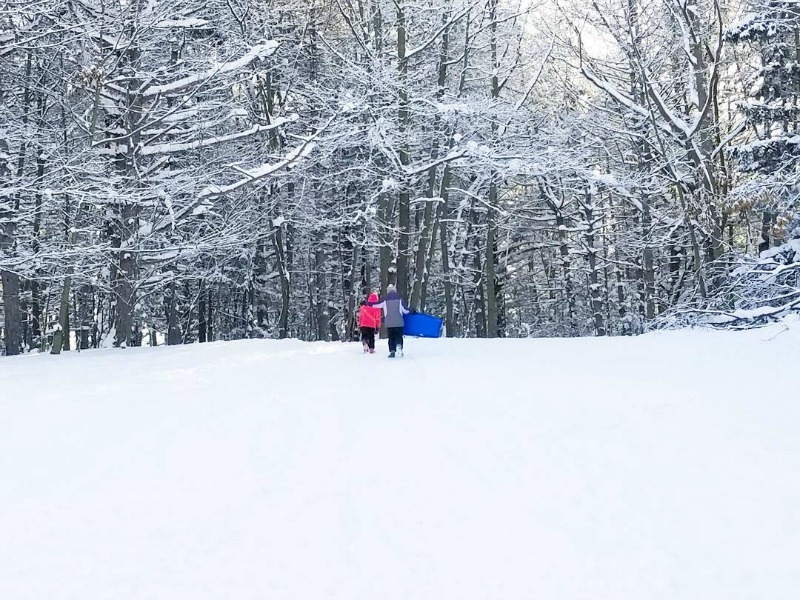 We are enjoying all that winter brings to us though, including almost daily sledding trips during the long holiday break! While I’ll be looking forward to grabbing up some early strawberries from my Floridian and Californian friends this March (thank you for shipping them to Michigan – we are so thankful!! ), this time of year we like to enjoy what is left from our summer blueberry and cherry picking freezer stash so we don’t grow tired of the same oranges and bananas through the long winter months. Because we have such long winter here, we do rely on dried fruit a bit! Drying fruit throughout the seasons is something our ancestors would have done to preserve the food growing in their area for times like winter when food is at lower supply, and it is so smart! Dried fruit keeps in the pantry easily, and provides a real food source of some pretty important vitamins and minerals our bodies need – not to mention tasting pretty amazing! Dates and figs are probably our household favorite, and since organic fresh produce was slim pickings this week (or way more than I care to afford! ), we’ve been enjoying figs! (The linked brands are what I pick up at Costco). Not only do figs taste pretty amazing, they are packed with potassium and magnesium – minerals that most of us could use a little more of! They are a great, real food source of fiber, as well as vitamins like B6 and K. They are readily available in most stores, and they are really cost effective on Amazon or at Costco. My kiddos have been ready for a breakfast change up, so my big bag of dried figs from Costco was the perfect reason to hash out a new recipe just for them…and for you! 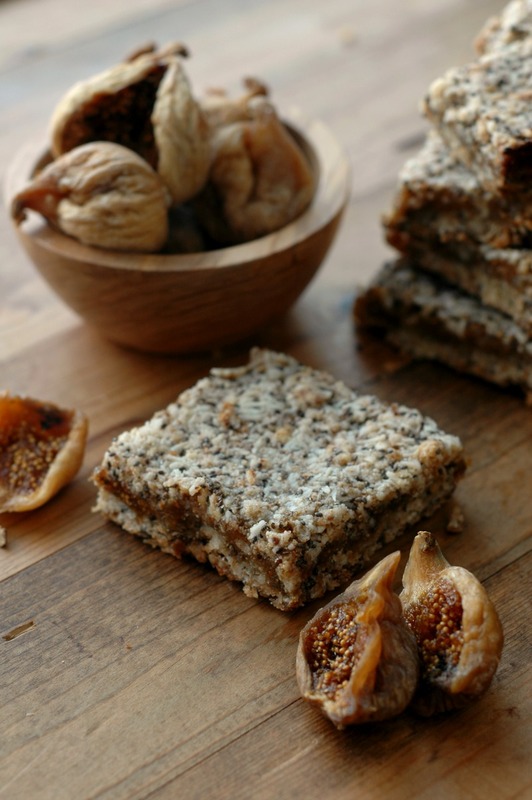 Sweet, dried figs layered with some power packed, fat and protein loaded ingredients make for a great addition to any school morning breakfast, or an easy, pack-able morning snack for school too. Busy momma, I haven’t forgotten you! Because let’s face it…none of us have time for a fussy breakfast prep on busy school mornings! 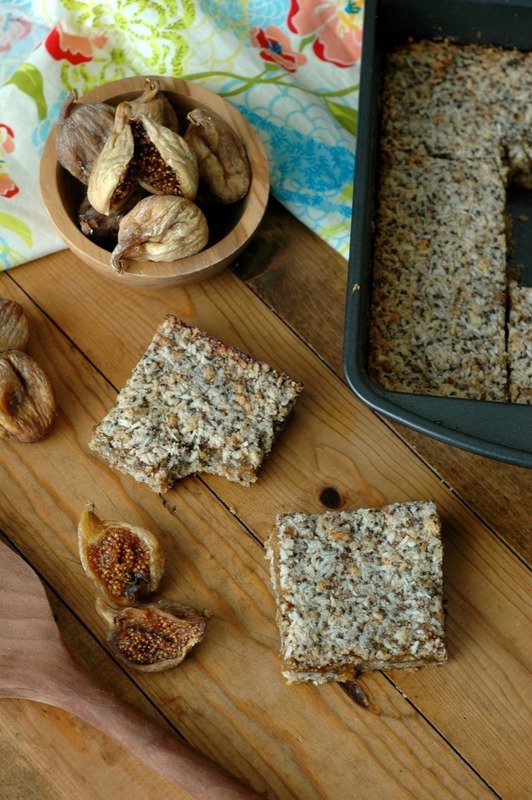 Not only are these fig breakfast bars easy enough to make the night before school, they are freeze-able! Which means you can double batch them on the weekend (or whenever your “prep day” is), and keep them in the freezer. The kids can pull their own bars out in the morning on the way to school, and that is about as hands-free prep time as it gets! I’ve made these bars at least a dozen times over the last week, and I’ve got some tips to help your kitchen time flow super fast! The pan can be put together in the time it takes your oven to pre-heat if you simmer the figs while you prepare the crust in the pan. The bars need to cool completely to set up before cutting, so you could potentially bake them off in the evening and stash them away in the pan in the fridge til morning when you cut them up for breakfast. Otherwise, getting the bars made up on your prep day list will be beneficial – you can double up and store them away. Do not try to double the recipe into a larger pan – the middle doesn’t cook or set up as well. Instead, I doubled up into two 8×8 pans, and they cooked beautifully. For some children, a fig bar and a cup of raw milk or coconut milk would be the perfectly portioned breakfast. For others, a fig breakfast bar with a side of hard boiled eggs or sausage and a cup of yogurt will be best. Still others will be one way this week, and the other way the next! 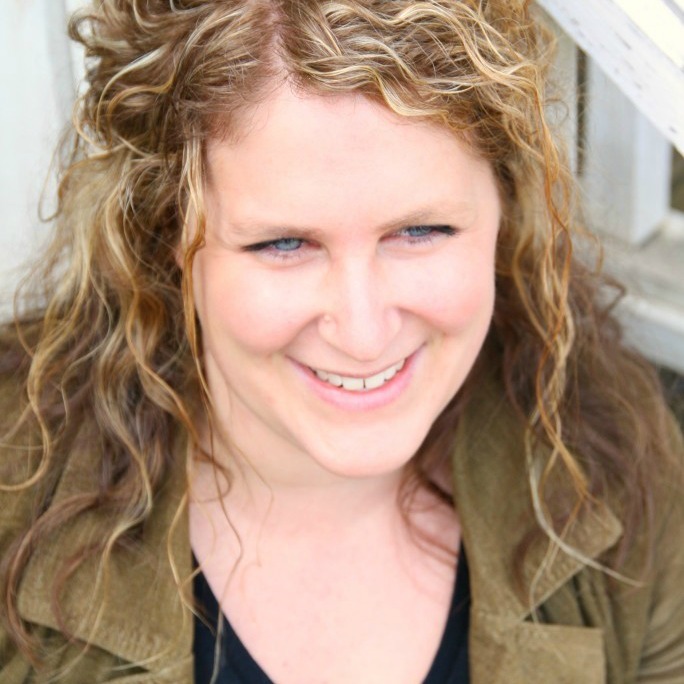 Bottom line…all kids have different appetites and growing periods, so listen to that. For the toddlers who tend to eat 2 breakfasts, this is a great second breakfast mid morning! Start them off with some eggs and/or veggie hash, and milk in the morning when they get up, and finish off their morning with a bar when they get hungry while you are out grocery shopping! I’ll be using these bars for my school aged kids in their morning snack boxes a lot I think. When I use them for breakfast, they will be having theirs with sides of sausage and raw milk or coconut milk. While I did make quite a few batches of the bars, there is no way I can possibly test out every swap option. I’ll list out what my thoughts are, and if you do try a certain swap not listed here, we would love it if you would leave your results in the comments so others may use your method if they need that swap too! Fruit swaps: dried apricots, dates, and dried mangoes should all work quite well. I also think that even just a fruit jam you have sitting around would work, though watch the added sugar on some of those. Coconut shred swaps: Sprouted oats work well for the coconut shreds if you can tolerate oat grain. While I did not test swaps for the almond flour, I do think that sunflower seed meal should work fine. If you try a different gluten free flour, start out with a smaller amount – you can always add more if it’s too wet. Chia seed swaps: Flax meal works well if you prefer that, or you can swap the chia out for more coconut shreds which also works. I like the variety of having a healthy seed in there, but if you do not tolerate chia go ahead and swap it out. 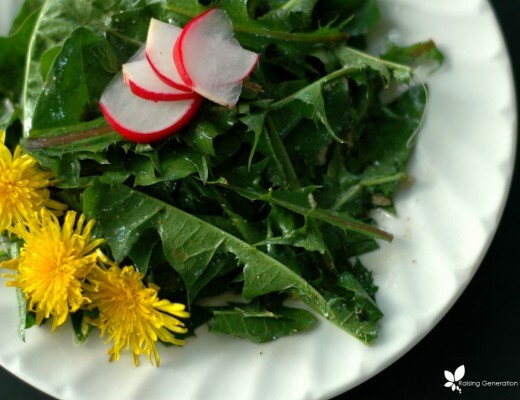 The grassfed collagen is optional if you do not have it around. If you have it sitting around, it does add another protein component to the bars. 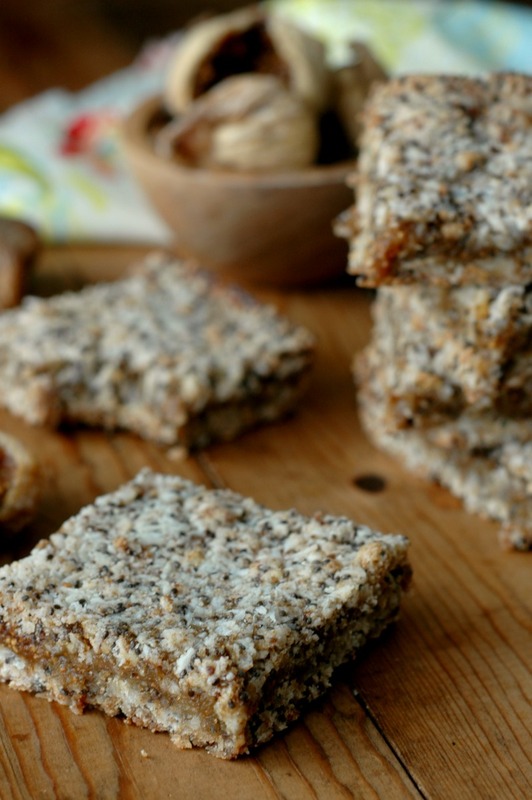 Make breakfast or snack time count with quick prep, freezer friendly, and power packed gluten-free fig breakfast bars! Up to ¼ cup grassfed collagen This is completely optional, but does add another protein component. If you don’t have access, simply leave it out – they work either way! Put the dried figs and water in a small sauce pan and bring to a simmer for 10 minutes while you prepare the crust. 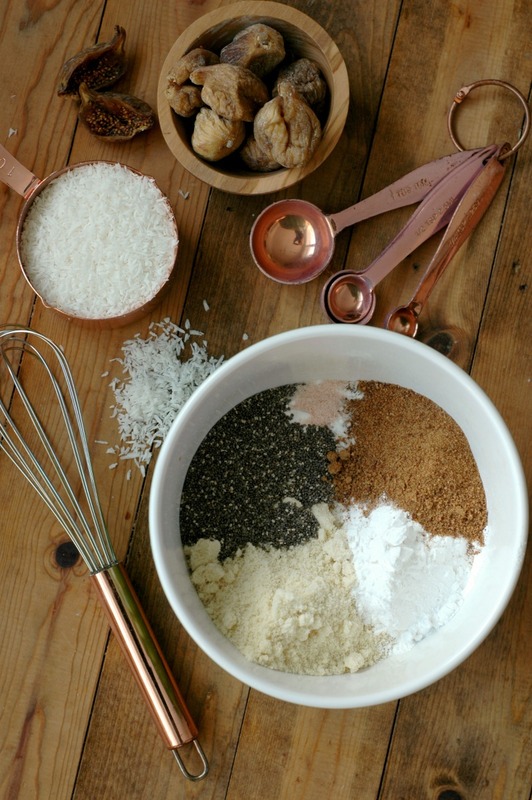 Whisk the dry ingredients (shredded coconut, chia, flours, coconut sugar, baking soda, and salt) in a medium mixing bowl. Melt the coconut oil, turn off the heat, and add the vanilla. Add these wet ingredients to the dry ingredients and stir to combine. Use your 1 cup measure to take out 1 cup of the crust mixture, and set aside. 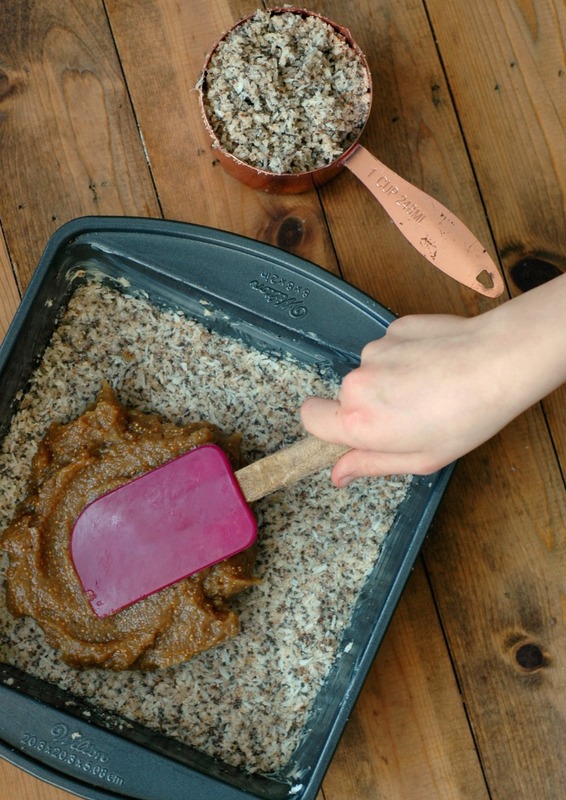 Press the rest of the crust mixture into the bottom of a greased 8x8 baking pan (grease your pan with organic palm shortening, coconut oil, or butter). Blend the simmered water/fig mixture in your food processor, and spread over the top of the pressed down crust in the pan. It spreads really easy like jam. Sprinkle the reserved 1 cup of crust over the top of the jam and lightly press it down, making sure to get the sides and corners too. Bake at 350 degrees for 25 minutes until the crust is lightly browned. Let the pan cool completely before cutting the bars so they can set up. If you cut the bars while warm, they will fall apart. In fact, I found that cooling it in the fridge or freezer made for the cleanest cutting. Once the bars are cut, you can store them in an airtight container for a few days, or pop them in a freezer bag to freeze up to 3 months. These look awesome! Going to try making them today, but I don’t have figs…if I were to swap the figs for dates, how many dates would I use? Hi Alyssa! That’s a great question! They are about the same size as the figs so I would use about 9 – after cooking it down if it looks watery, you can always add another date or 2 and blend it into the “jam”. It is pretty forgiving – I added and subtracted often while I was trying to figure out the amount of figs that I liked in there! Let us know what you end up doing! Yay! I’ve been looking for a recipe to use a huge bag of dried figs I acquired. This looks perfect and I have the ingredients. Thank you! I love it when that happens! Enjoy them Mindy! Do you add the collagen to the figs and blend? Hi Kate! Great question! I have done both adding to the fig mixture, and the crust mixture and both work! This recipe looks amazing. I will be including it in my meal prep for the week!! I also like the ideas about first and second breakfast. Both my girls are big eaters and I feel like Im always running out of ideas for healthy, GF snacks. I’m thinking we need a change in our breakfast rotation, too! These are perfect! I love how you made your own “fig jam” for the middle layer. I bet if I use a bigger batch of figs, I can just save some as a fig spread? I have already printed this off to try! I am going to try using hemp heart and oats to replace the coconut as my kids are averse (crazy!). Wholesome and delish! I might also add some orange or lemon zest to fig mixture! Can’t wait! These are soooo a breakfast I would grab and go! Yum! Oh I love these!! Fig Newtons were the only “cookie” my mom bought growing up, and figs are my favorite favorite fruit. I’ll have to buy the dried ones at Costco you mention. 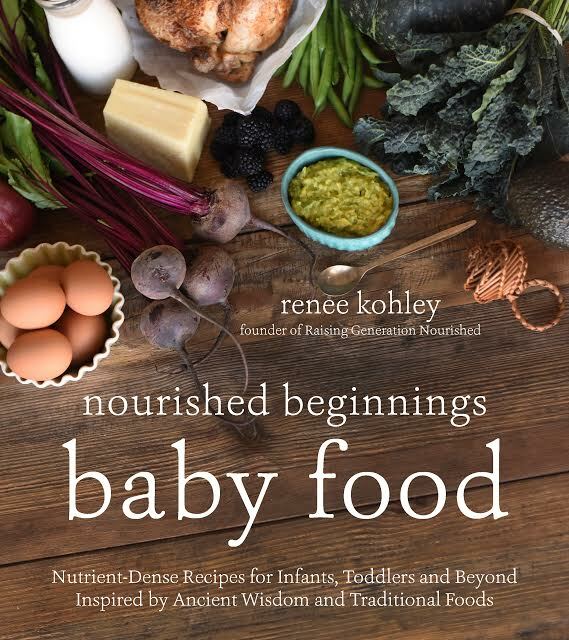 Can’t wait to make these, Renee! My kids will love them, and I love that they’re freeze-able! These are so great for those busy mornings when I have to run out the door. I love all the various swaps you can make too! Fig is so yummy and healthy! What a delicious breakfast idea! These are amazing! I replaced the the coconut with 1/2 cup hemp hearts and 3/4 cup rolled oats. I whirred all the dry in the food processor, then added the oils and vanilla in. Really yummy….hoping my kids will eat them too so I am not tempted to eat the whole batch! Oh, and I used a stuffed full cup of the quartered figs! Thank you for such a wholesome recipe! Thank you Tessa! I’m glad you enjoyed them! 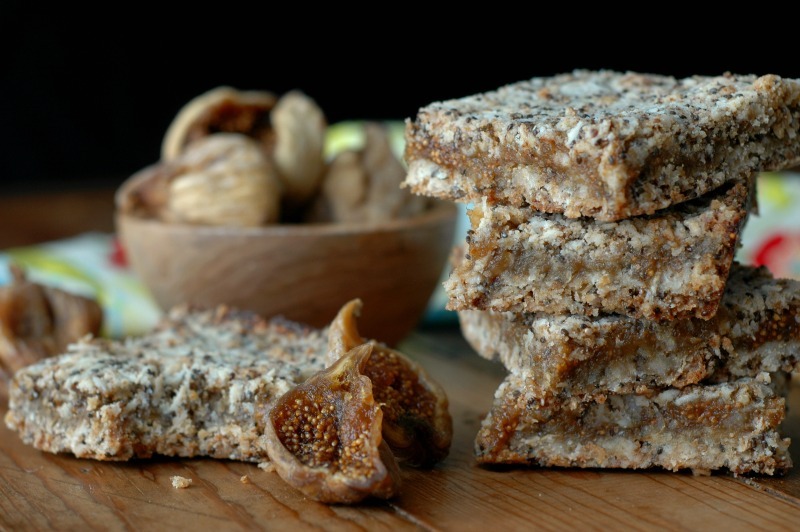 What a great healthier option for fig newtons! I also really like all the other options you have included. I had no idea it was so easy to make fig bars. I’m going to whip some up for my son to take to school. I love breakfast goodies like these, and they’re so healthy too, what a bonus! I was just looking for a good breakfast/snack bar, this is a great option! My hubby bought a giant bag of organic dried figs from Costco. Now I know what to do with them. These look amazing. YUM! These look so good!!! 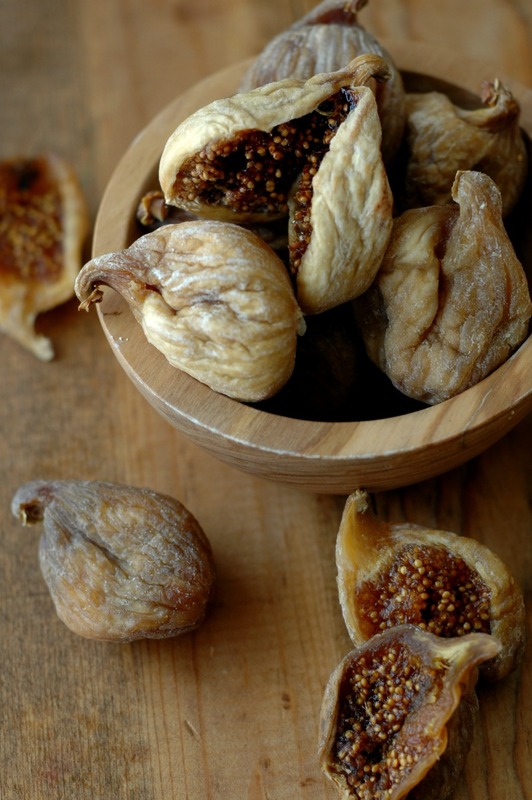 I’ve been eating dried figs pretty much daily lately, I love this use for them! I can’t wait to make some of these beautiful bars. These look so delicious and definitely a fun breakfast! Love all the healthy add-ins! These look so sticky and delicious! These look so tasty and healthy too! Thank you! I love the dried figs from Costco! I love these bars, I have to make them for my kids (and me!) – they’ d be great for car trips and flights too! I cannot have arrowroot ( or tapioca flour) can I substitute it with coconut flour or Tiger nut flour? Hi Ann! Coconut flour and tiger nut flour have really different baking properties. I think you could do it, but you would have to play around with the amounts. Love figs. They are one of my favorite types of natural sweets ! i am absolutely saving this recipe for later! As a busy mom i appreciate the ability to freeze them and make big batches on weekends! These sound so delicious! 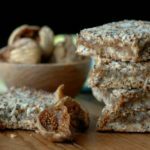 I love that you included so many tips for modifying because I can’t do coconut, but would love to try these with oats! These look so good! One of my children can’t have coconut. Is there something I could try swapping it out with? I have a little one that reacted to nuts. What could you replace the almond flour with? Pumpkin seed flour? Sunflower seed flour? 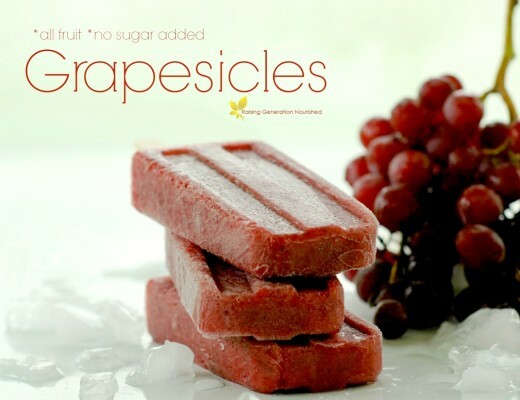 Could I use fresh fruit, pureed….? What could I use to thicken it?